The Chester County Chapter has been recognized as a Group of Distinction by the Penn State Alumni Association, reaching the highest recognition of that group of Elm. 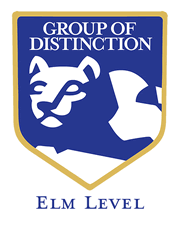 A Group of Distinction is an affiliate group that meets a number of criteria, including being actively involved in such areas as student support and interaction, networking and fellowship, sports activities, community service projects, membership support and recruitment, communications, volunteer awards program, Alumni Leadership Connections, Homecoming, and THON-related events. Congratulations to Chapter President, Ann Mau, the Chapter Officers and Board Members, volunteers and participants for all of our activities making 2016-2017 such a success!